In addition to my Kodály newbie blog this week, I’m here to talk about children’s literature for music class. What do you use? I love learning about new literature for the classroom! This week went pretty well. I sat down with my copy of The Music Effect by Joy Nelson, as well as Sound Thinking by Philip Tacka and Micheál Houlihan and I started out by scripting out my Kindergarten lessons. I know the new Kodaly in the Classroom books exist, by the same authors, but I think it’s really important for me to do it, not rely on someone else. I have the advantage of knowing most of the kids, so my first lesson is sort of a review, and a run down of some procedures like rules, and then just getting the kids singing. I personally think my 2nd lesson is more interesting because we aren’t going over rules, so let’s take a peek. As you can see, my second lesson uses a lot of steady beat. The purple is all of my transitions. They will be words I am choosing to make a conscious effort to say to the kids. I will be also trying to make a conscious effort to stay out of it. This is the essential part of a ‘story’ lesson plan. It is also the way I can tie together songs that don’t really have a common theme. Chop Chop Chippety Chop is about food, and Johnny Works with One Hammer isn’t farm either, but they both work using the transitions. I even found a way to use a transition to add in time to practice for the kids singing in church in October. I haven’t picked the song yet, but I usually add some finger play, or steady beat movement with it. You can see my lesson plans have something called “Entry Points”. This is something I learned this summer from Joy Nelson that really involves addressing multiple learning styles so that students can be engaged in several ways. I’m warming up with the Moosical Vocal Explorations I grabbed from Sally Utley during the Back to School sale. I’ve only got 30 minutes, for the entire week with them, so I feel like I need to pack in a lot! I’ve always tried to get a lot in for K – again, here my having them as preschoolers can really help me out since they will have a good foundation. Even still, I am really aiming to finish each lesson with a book, story, poem, or song story. 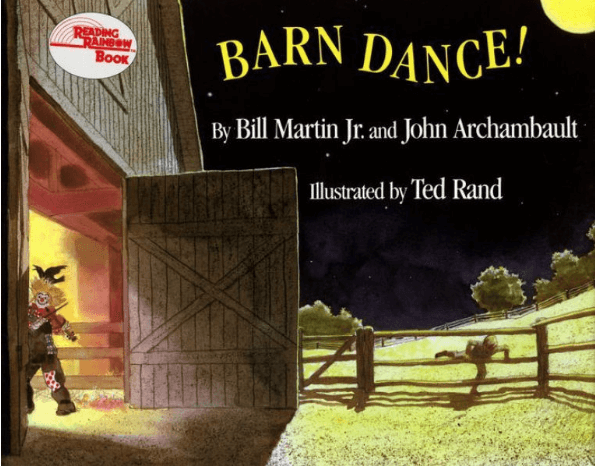 This week’s lesson (since we are on the farm) will end with the book Barn Dance! by Bill Martin Jr. and John Archambault. In addition to being a kids’ classic, its I love the way the book talks a little about square dancing. Plus it’s got tons of similes (“like a”, “as a”). It fits well with the theme, and its fun! This is truly a great book to let the kids imagine sounds. It’s also great because there is a rhythm to the words as you read. This would be a book that could easily be used to incorporate some ostinatos of the text. The next book I’ll talk about is my book for week 3. Acoustic Rooster and His Barnyard Band by Kwame Alexander. This is a great tie in for jazz (several animals are named for jazz greats – like Duck Ellington). It reads rhythmically, and the main character doesn’t win, which is always a plus in my book. I love tossing in those life lessons when I can. You can even hear the author read it here. Next up, the big green book I got mid-year last year and never opened because it seemed too daunting to start. I did some folk dances with the kids last year but they were all from the New England series. This book is probably the best place to start with the younger kids and since my goal is to do even more folk dancing, I’m busting into it! I’m looking at the level one dances for first grade and trying to sort through them. I love reading about how you plan! 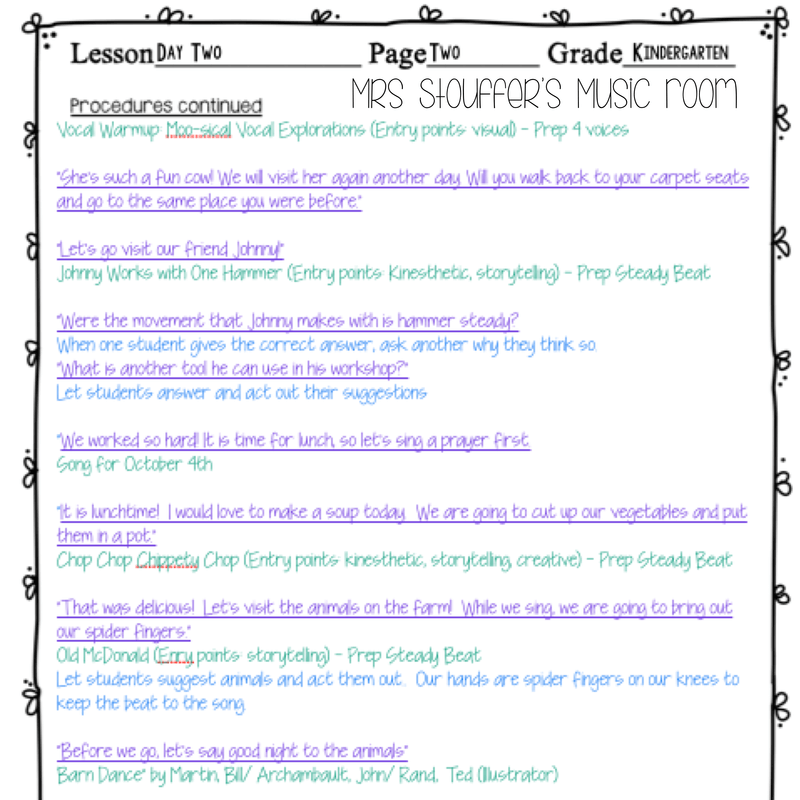 I also use “storytelling” in my lesson plan to weave musical magic for my Kindergarten and First Grade students. It’s such a powerful tool! And Barn Dance and Acoustic Rooster are new to me! They’re going on my Amazon Wishlist right now! Thanks!